Panda Free Antivirus is another iteration of Panda's free antivirus solution which is able to protect a PC against many different threats including viruses, malware, worms, roots and adware. The antivirus software takes a nod from the new look of Windows and provides a clean and bare interface which is rather easy to use. Unfortunately, Panda Free Antivirus is an ad-supported program which may offer to install various third-party applications which may prove to be problematic. The main detection engine used by Panda Free Antivirus isn't bad at all and is effective at detecting malware. Version 18.07.00 is a freeware program which does not have restrictions and it's free so it doesn't cost anything. 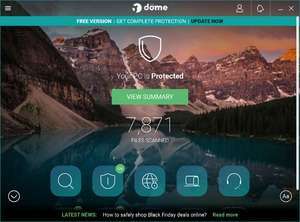 For security reasons, you should also check out the Panda Free Antivirus (Panda Dome) download at LO4D.com which includes virus and malware tests. Additional screenshots of this application download may be available, too. 3 out of 5 based on 45 ratings.